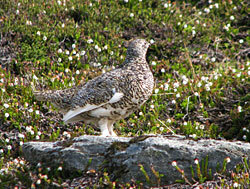 White-tailed ptarmigan are true birds of the mountains. They live above timberline almost all year in the young mountain ranges of southcentral and southeastern Alaska, and many whitetails stay on the high slopes even in winter. In the breeding season they live in rugged country full of boulder fields, snowfields, glaciers, cliffs, and rockslides at higher altitudes than any other grouse or ptarmigan. This is the ptarmigan that Dall sheep hunters flush off high mountain peaks while stalking rams. Plants on the summer range of white-tailed ptarmigan are low, prostrate, and often separated by patches of frost-heaved soil or rock. The birds usually move lower in late fall, spending the winter on slopes or in high valleys where alders, willows, birches, and occasional spruces project above the snow. Unlike the other two species of ptarmigan, the whitetail’s eight pairs of tail feathers are pure white. These feathers are a year-round trademark of the species, since whitetails molt only once each year, in midsummer. Whitetails are almost pure white in winter; even the shafts of the wing feathers are pale instead of black as in the other ptarmigan. The summer plumages of both male and female are quite different from the other species, the back feathers are much more finely barred (“vermiculated”) and the overall color tone is grayish instead of brown. Whitetails are the smallest of all the tetraonids, weighing only three-fourths of a pound when mature. Late in April the challenge calls of white-tailed ptarmigan echo across the rock-strewn slopes and cliffs of the high country, signaling the annual round of sparring between males, and the mating of male and female. According to a biologist who studied whitetails in Montana, the female does not always nest within the area defended by the male. Nests, containing four to eight eggs, often are on narrow, mossy ledges or against big boulders where the sun’s warmth is radiated from the rock face. White-tailed ptarmigan in Southcentral Alaska lay eggs in late May, earlier than whitetails at the southern end of the species’ range in Colorado. The reason may be that snow melts sooner from the habitat of the Alaska whitetail. 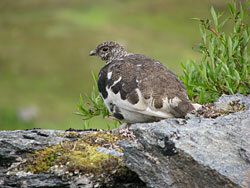 Broods of young white-tailed ptarmigan, under the care of the hen, stay high on the breeding grounds all summer. They like moist areas, especially around the edges of melting snowpatches and below glaciers. Plant growth is delayed in these places, so that when the broods feed there they are taking advantage of the youngest, most nutritious vegetation on the summer range. The water itself may be important to the ptarmigan as well, and insects are probably more abundant in moist places. Rockslides and boulder fields also are important features of good summer habitat for whitetails, because the chicks hide from predators in crevices between large rocks. White-tailed ptarmigan eat large quantities of tender leaves in summer, with lesser amounts of flowers, buds, and insects. Seeds and berries are taken commonly in August and early September. The birds change to a diet of buds and twigs in late fall. White-tailed ptarmigan apparently are not as specialized regarding winter foods as rock and willow ptarmigan in Alaska, because they eat alder catkins, willow buds, and dwarf-birch buds with seemingly equal gusto. The white-tailed ptarmigan is a fascinating creature to naturalists who roam the western mountains. Not only does it still have the aura of mystery surrounding birds whose lives are poorly understood, but what little is known about the species suggests that it is very different from rock and willow ptarmigan; its voice and size also set it apart. Whitetails may live much longer, on the average, than other ptarmigan. They are not semi-migratory or nomadic to the extent willow and rock ptarmigan are, and may not fluctuate as widely in numbers from year to year. Even in some small details of anatomy, such as the relatively small size of the heart, the white-tailed ptarmigan is unique in the ptarmigan group. There are not many places in Alaska where people can see white-tailed ptarmigan in less than a few hours’ hiking. Some of the more accessible populations are on Mt. Juneau, Mt. Roberts, and at the heads of other valleys near Juneau, in Chilkat Pass (especially at miles 56–62 and at mile 90 Haines Road), at Rainbow Mountain (mile 209 Richardson Highway), in Thompson Pass north of Valdez, in Denali National Park, and near Independence Mine in Hatcher Pass north of Palmer. White-tailed ptarmigan are found only in western North America. They are the product of millions of years of evolution in rugged mountains, but do not compete successfully with other ptarmigan anywhere except in the rocky alpine. The five subspecies of whitetails range from the peaks of the Rocky Mountains in northern New Mexico and Colorado (where they live at 12,000 – 14,000 feet), Mount Rainer and Vancouver Island in the coastal mountains, to Southcentral Alaska and central Yukon. In Alaska, they typically do not occur much north of the Alaska Range. The shaded portion of the map indicates areas White-Tailed Ptarmigan are found in Alaska.